Hi Remodelaholics! 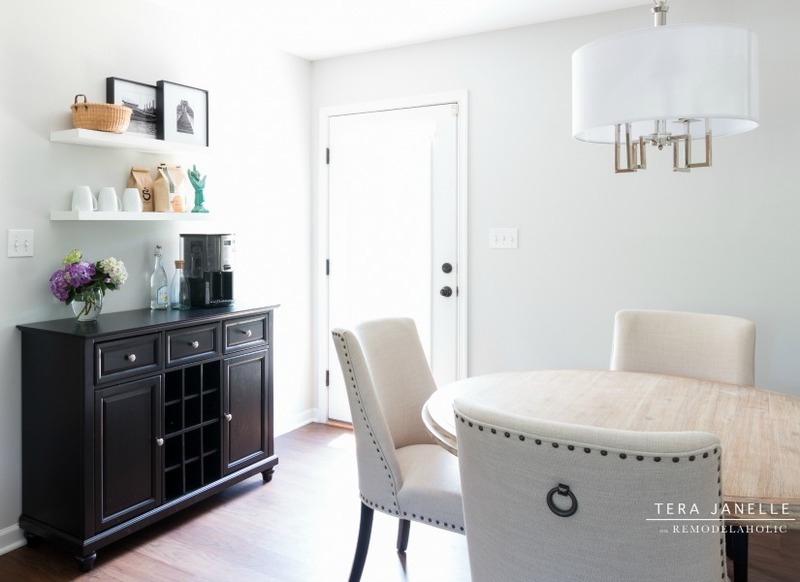 It’s Tera from Tera Janelle Design swinging by to say hello and to show the before and after photos from this recent dining room remodel. This project was all about reclaiming some clutter-free, grown-up space in the clients’ home. You’ll find all the sources for achieving a similar style at the end of the post! A little background on the Valley View Project. The dining room reveal was Reveal 2.0 on the project. We had already tackled the clients’ living room and kitchen, and it was time to finish off their open-concept space with a fresh, grown-up approach to their dining room. ABOUT THE PROJECT: Somewhere between the homeowners’ single days, throwing a wedding, buying a new house, and having a two year old — the furniture arrived. The couches were a bachelor purchase that had impressively stood the test of time. Other pieces were Craigslist finds or gifts, or the merging of two single-life apartments into one married-home. With the baby came toys, and as he grew, more toys. It was a home full of love and life and the day to day. But the homeowners were ready for a change. A grown up space. Storage. A cohesive design. A space that was beautiful and one to be proud of. But also a space that embraced the day to day, the play sessions on the living room floor, the media components, family dinners, late night lounging, and all those toy trucks. THE GOAL: An open-concept space that felt polished enough to entertain but family-friendly enough to embrace everyday life. THE DESIGN PLAN: The Valley View homeowners originally thought their design styles were conflicting, but as we spent time going through the initial phases of the design process, it became clear they had similar goals. They both wanted to create spaces that felt … Simple. Natural. Peaceful. Light-filled. Comfortable. First and foremost, they needed storage. Elmo, the toy trucks, the books, the media equipment… they all needed a place to go, preferably one behind closed doors. They also craved a space that balanced the traditional style of the home and neighborhood with their love of a more modern aesthetic. So I focused on modern lighting and embraced transitional lines in the furniture. In the living room, we designed a custom-built media center to serve as both a focal point for the room and to provide loads of storage. And we kept the overall styling paired-back and clutter free, leaning on neutral colors, natural elements, subtle pattern and texture, and simple design. The homeowners decided to Craigslist all of their existing furnishings, so we had an entirely fresh slate. We painted the walls “Gray Owl” by Benjamin Moore. Then we installed new wood-look vinyl planking in the kitchen and dining room, adding the warmth of wood with all the practicality of vinyl. And with a two-year-old boy, practicality and easy clean up was a top priority. The new drum pendant chandelier provides a visual link to the new light fixtures in the living room and hall, and the polished nickel finish provides a beautiful contrast to the rustic style of the new acacia wood dining table. The table’s round shape improves flow and can easily accommodate six people. Finally, the new sideboard provides needed storage, and the floating shelves and accessories polish off this bright, airy dining room with a little-bit-urban coffee house feel they love. Overall, the dining room’s simple design and neutral palette allows room for everyday life to move in — the laptops and booster seats and finger paints and toy trucks, cause that new vinyl floor is a primo race track. Gotta win the kiddo over too! Yet the room has enough space to absorb those items of everyday life without feeling cluttered. The homeowners love coffee, so creating a coffee station was a no-brainer. And the black sideboard adds contrast and grounding to the otherwise light and neutral space. For further contrast and to incorporate unique-to-them moments (so important in creating a home), I printed black and white prints from their awesome travel photos and then stacked the framed prints for a casual feel. We also incorporated a bit of love from their two year old — it was a gift from Mom and two-year-old Isaac to Dad for all his work in creating a home they love. Isaac speaks baby sign language, so this ceramic “I love you” sign reminds us all what these spaces are about — a home that embraces life as a family. Oh, those sentimental details get me every time! In the end, these open concept spaces turned out simple, textured, beautiful and quiet. And with a two-year-old in the house, those words are gold! And if you missed their living room reveal and love organization as much as I do, you will want to see this beautiful, multi-tasking custom build we added as a beautiful and practical focal point of their new living room design. It houses everything from media equipment to Elmo to dump tricks, and really… don’t all parents need a piece of hardworking furniture like that? Out of respect for our clients, their budgets, and their desire for a unique space, we share some but not all sources. Tera Janelle is a designer, photographer, and list-loving woman who adores sweet potato pancakes and a good country song. She is a Wisconsin farm girl who grew up and fell in love with the Blue Ridge Mountains of Virginia, where she presently masquerades as a Southern gal. She adores nearly every type of cheese, sunny days, classic interiors, and the perfect shade of gray. Tera has spent the past 10 years working in staging, renovations, construction, and design. She has had the great honor to design all varieties of spaces, from boutique commercial projects to charming, historic homes. She prides herself on affordable, classic, and comfortable design—offering a variety of design services to suit every budget. Find more of her love for renovation, bright interiors, and marble anything on https://www.instagram.com/terajanelledesign/, or from time to time on her blog. It’s Turning Tables DIY Week! Where is the rug from (or did I miss it in the post)? Beautiful! Was the Gray Owl lightened? It was the standard Benjamin Moore Gray Owl formula. I love it against the linen tones in this space. Thank you so much for stopping by, Jen! Wow, what a transformation! The space is beautiful! And all the kiddo toys are still there, just tucked behind closed doors now. So both parents and baby are loving this space! What a fantastic transformation and those dining table chairs are gorgeous! Thank you, Jenny. Pier One for the win on those chairs (Corrine linen). And they are comfortable too! I’m guessing that is an American company. I’m from the UK – you guys seem to have so many fab shops that I wish we had over here! I’m hearing all the time how good Target is! Oh my, yes. I wish I could take you to Target! It’s a goldmine of affordable home decor, though it can quickly become an addiction. 😉 You’ll have to peruse their items online so you can see what all the fuss is about. I especially love the Nate Berkus and Threshold lines. Hi Rick, thank you! There’s nothing quite like a black and white gallery wall, especially when the images have meaning! Any simple black frame will do, but I especially love the depth of these Michael frames. Happy picture hanging!